People ride their bikes for many reasons. Some ride for exercise. Some ride to commute to school or work. Some ride to enjoy the outdoors alone or with friends. Or, all of the above. The Cycle de Mayo Festival will be held on May 5, 2018 in Riverdale, Utah. On Saturday, May 5th, Weber Pathways, Weber County, Riverdale City's Live Fit team, The Ogden Bicycle Collective, and Weber-Morgan Health Department have put together an event called Cycle de Mayo to promote bicycling versus driving for light shopping and dining. The purpose is to make more people aware of how pathways available to citizens throughout the Weber County area can sometimes provide more convenient access to those businesses. Riverdale is a central location on the path therefore Riverdale City is also promoting the use of the trail system. Riverdale Town Square and The Crossing is centrally located to all riders from the north, south and west, making it a great biking destination. And, because of its diverse business environment, it’s perfect for this event. The promotion is designed to bring people from as far as Ogden, Layton, Hooper and Clearfield through the bike paths to the Riverdale Town Square and The Crossing. Once the riders get there they will be greeted by bike valets who will rack the riders’ bikes for safe keeping while the participants visit local businesses. Event participants will be given a swag bag where they will be directed to all the businesses at the center who participate in the event. Riders will visit those businesses for their swag reward. 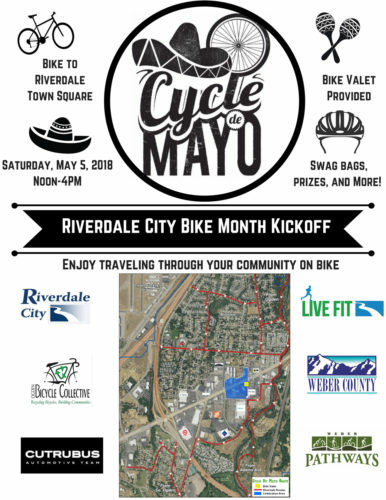 Visit the “Riverdale City Utah” Facebook event page for a map with recommended bike routes and bring the family out to enjoy the Cycle de Mayo Riverdale on May 5th from 12 to 4 pm.